On the last day of the International Astronautical Congress in Adelaide, Australia, SpaceX CEO Elon Musk took the stage to discuss his company’s BFR project. In addition to sharing details on how the technology might be used to revolutionize long-distance travel on Earth, Musk also explained how it could support our off-world activities. The basic idea behind the BFR is to create a single booster and ship that could replace the company’s Falcon 9, Falcon Heavy, and Dragon. This would allow SpaceX to pour all the resources currently split across those three crafts into the one project. Once completed, the BFR could be used to launch satellites and space telescopes or clean up space debris. It would also be capable of docking with the International Space Station (ISS) for the delivery of cargo. Most excitingly, though, is the BFR’s potential to facilitate the establishment of off-world colonies. Musk’s aspirations go well beyond the Moon, though. 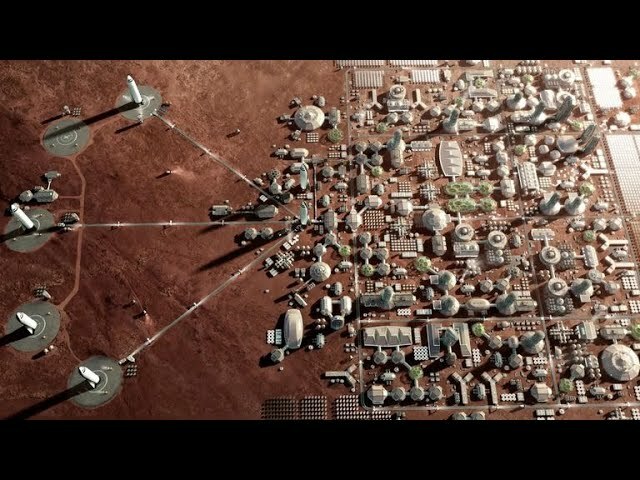 SpaceX’s goal of heading to Mars as soon as they have the technology to do so is well known, and during last night’s presentation, Musk shared imagery of a fully-fledged Martian city. Two years later, SpaceX would send astronauts to the Red Planet aboard two crewed BFRs. These first “settlers” would construct a fuel plant that would serve as the beginning of the Martian colony. After that, the plan is to build multiple landing pads, then expand out into terraforming and the construction of an urban environment.Musk’s objectives are indisputably audacious. However, putting humans on Mars will take some big, bold ideas, and his certainly qualify.